This movie is based on a true story. Benjamin Mee (Matt Damon) is a young professional with two children, a teenage boy of fourteen and a seven-year-old daughter. His wife and the mother of the children died due to a sudden and unexpected illness, and the three are trying to cope with the terrible loss, each in their own way. Benjamin is a caring and sensitive father. He somewhat succeeds comforting his daughter, but he seems to be fighting a losing battle with his son, who becomes increasingly withdrawn and morose. To make positive changes, father and daughter decide to move, against the boy’s wishes. His friends are all he has left of his old life, and moving away will take them away too. The search for houses turns out to be difficult. When they finally find the perfect place they learn that it comes with strings attached, huge, massive cables of strings, that is. Due to stipulations in the deed, and state regulations, the new owner must take over the zoo that comes with some 200 exotic animals of over 40 different species, and six employees that haven’t been paid and have somehow managed to keep the animals fed and alive out of their own pockets. Against the better advice of friends and relatives, Benjamin faces the challenge, takes out his checkbook and gets to work. It turns out, running a zoo requires skills and resources way more complex and voluminous than Benjamin would ever have imagined. 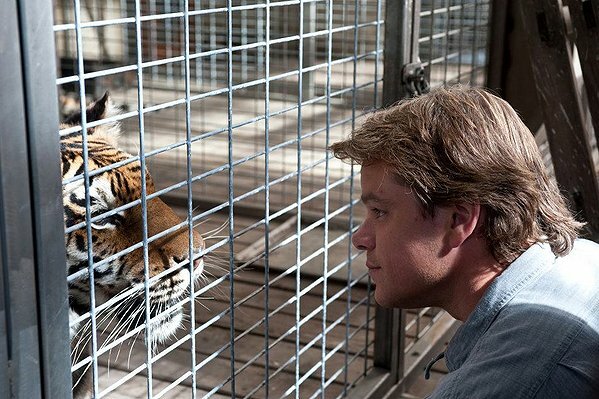 We Bought a Zoo is a light comedy, well acted by veteran Matt Damon and the cast of supporting actors. It’s an almost believable story and entertaining to watch. I chuckled and laughed at times, and there was heartfelt connection when things got difficult. A great movie to rent and enjoy.